This data set reports phosphorus (P), carbon (C), and nitrogen (N) nutrient pool concentrations for forest soils and roots and P pool concentrations for forest floor litter, soil solutions, and microbial extracts. Soils samples were also extracted using the Hedley sequential fractionation method and the extracts analyzed for P. Nutrient pool concentrations are presented on an areal basis of 1 hectare to a depth of 10 cm, as calculated from soil bulk densities and respective pool biomass quantities. There is one comma-delimited ASCII file with this data set. These measurements were made during a soil P addition fertilization experiment conducted at the km 83 site, Tapajos National Forest, Para, Brazil. Control and fertilized plots were established in both sandy loam and clay soils. Soil cores were collected every 4 months from August 1999 through April 2000 (McGroddy et al. 2008). The investigator was McGroddy, Megan. You may contact McGroddy, Megan (mcgroddy@gmail.com). This data set reports phosphorus (P), carbon (C), and nitrogen (N) nutrient pool concentrations for forest soils and roots and P pool concentrations for forest floor litter, soil solutions, and microbial extracts. Soils samples were also extracted using the Hedley sequential fractionation method and the extracts analyzed for P. Nutrient pool concentrations are presented on an areal basis of 1 hectare to a depth of 10 cm, as calculated from soil bulk densities and respective pool biomass quantities. These measurements were made during a soil P addition fertilization experiment conducted at the km 83 site, Tapajos National Forest, Para, Brazil, between April 1999 and April 2000 (McGroddy et al. 2008). Control and fertilized plots were established in both sandy loam and clay soils. Soil cores were collected every 4 months from August 1999 through April 2000. In addition to its role limiting primary productivity, work has suggested that soil P is linked to soil C sequestration capacity in highly weathered soils (Giardina et al., 2004; Li et al., 2006) although the relationship is not well understood. Our ability to predict the C fluxes in tropical forest ecosystems under changing climate conditions depends on our understanding of the interaction among soil P pools as well as the regulation of these pools and their relative size by soil environment. For C and N analyses, acetanilide (10.36 % N and 71.09 % C) was used as a reference standard. Samples were analyzed in duplicate and rejection criterion was set at > 10% variance between duplicates. Total P was determined after a H2O2 predigest and modified Kjeldhal digest of ground plant tissue (J.Tilley pers. comm.). NIST apple leaves were used as a reference standard and acheived a 98 (+/- 2) % recovery. The total soil P values by summation of fractions was comparable to the measurements by the HF method (estimated method precision of + 25%), but regression analysis suggested that summing of fractions slightly overestimated total P at higher concentrations and underestimated P at lower concentrations. The study was conducted in the Tapajos National Forest, 83 km south of Santarem, Para, Brazil (2 degrees 64 minutes S and 54 degrees 59 minutes W). For additional site description see Silver et al. (2000), Keller et al. (2001) and McGroddy et al. (2004). The planalto area south of Santarem is dominated by well-drained dystrophic yellow-brown lateritic Ultisols (Latossolo Amarelo textura muito argilosa in the Brazilian classification system), derived from the sandy-clayey lithography of the Alter do Chao formation (Cretaceous-Tertiary, Irions 1984). In addition to the dominant Ultisols, deep well drained sand/sandy-loam soils (Oxisols, Neossolos Quartzarenicos in the Brazilian soil classification system), developed from sandy sediments deposited during the Quaternary, occur in the same region (Rodrigues et al. 1991). Plots for clay soils were located 250 m south of the southern boundary of the area marked for selective harvesting while the plots on sandy soils were located 350 m east of the eastern boundary of the same area. Three study blocks (12 x 100 m) were established on level terrain in each soil type within the Tapajos National Forest. Blocks were divided into five 12 x 20 m plots with fertilization addition and sampling restricted to the interior 4 x 20 m zone of the first, third and fifth plots, leaving the rest of the area as buffer. Plots were located and incubation cores installed in March 1999. Soil collections began in April 1999 and continued every 4 months afterwards through April 2000. 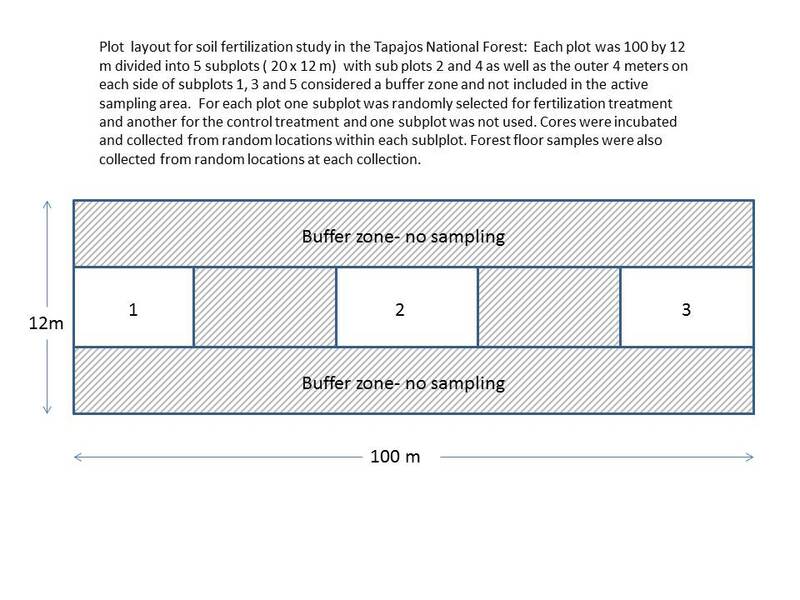 Fertilizer was applied to one randomly selected treatment plot in each study block at three points over the course of the study period (May, August and December of 1999). Root, microbial and soil P dynamics incubation cores were 10 cm high and 6 cm in diameter and were constructed from plastic canvas (Darice 7 count plastic canvas, 2 x 2 mm mesh). A total of 360 root incubation cores were constructed. We selected 216 cores for inorganic P leachate estimates; the bottom of these cores were fitted with 6 cm dia. silk resin bags containing 3g of Cl charged Biorad AG 85 anion exchange resin beads. For each core a soil sample was taken using a 6 cm diameter soil corer to a depth of 10 cm. Visible roots and large pieces of organic material were removed by hand and the homogenized soil from each sample was packed into a plastic canvas core thus maintaining representative bulk densities. At each of 15 randomly selected locations within the plot a set of three cores was installed to allow for fine root biomass measurements as well as soil and microbial biomass P measurements. All incubation cores (total of 180 sets or 540 cores) were installed in April 1999. Cores were collected 4, 8, and 12 months after installation (in August and November 1999 and April 2000). At each time point, we collected 5 sets of incubation cores, we also collected 6 bulk soil cores and 5 forest floor samples from each treatment plot for further estimates of soil, root and litter layer P dynamics. Three of the bulk cores were analyzed for fine root biomass and nutrient content and the other three for bulk density and soil and microbial P pools. Results of measurements of soil nutrient concentrations on 0.5g soil sample extracts are presented on an areal basis (1 hectare to 10 cm depth) calculated by multiplying concentrations by soil bulk density values measured at each plot and collection point using a standard volume soil corer (10 cm high and 6 cm in diameter). Soil pH in 2 M KCl was determined on a 1:1 slurry of fresh soils from the initial soil collections done in April 1999. These analyzes were done in at the EMBRAPA analytical labs in Belem, PA, Brazil. All further analyses were done at the University of California, Berkeley. Soil texture was determined for one composite sample from each plot using the Bouyoucos hydrometer method (Gee and Bauder 1976). Total soil C and N were measured on air-dried, ground soils using a dry combustion- reduction method on a CE Instruments NC2500 soil analyzer (CE Instruments Lakewood NJ). Soil P fractions were determined using the modified Hedley fractionation method (Tiessen and Moir 1993, Frizano et al. 2002) on air-dried soil samples. Phosphorus concentrations of the extractant solutions were determined (1) on a Lachat QuickChem 8000 Automated Ion Analyzer (Lachat Instruments Division of Zellweger Analytics, Inc. Milwaukee WI) or (2) for extractant solutions with strong color on a Thermo Jarrell Ash axial IRIS ICP-AES (Thermo Elemental, Franklin MA). Strong coloration of the inorganic extracts made colorimetric analyzes imprecise so only total pools are reported. The total soil P values by summation corresponded to the measurements by the hydrofluoric acid (HF) digestion method (estimated method precision of + 25%) but regression analysis suggested that summing of fractions slightly overestimated total P at higher concentrations and underestimated P at lower concentrations (McGroddy et al. 2008). Anion exchange resin bags were stored frozen until they could be analyzed in 2001. Soil and organic matter were washed from the bags with distilled, deionized water, and each bag was extracted with 50 ml of a 0.5 M HCl solution. Bags with holes due to either root or soil fauna activity were re-weighed to get an accurate assessment of mass. Approximately 15 percent of the bags from the final collection point were colonized by root biomass. Plant or fungal uptake of P in the root colonized bags may have caused an underestimation of P captured by the resin and these bags were excluded from the analyzes. Orthophosphate in the extraction solution was determined using a molybdate blue analysis on a Lachat QuickChem 8000 Automated Ion Analyzer. An index of microbial biomass P pools was determined using the chloroform fumigation direct extraction (CFDE) technique with acidified NH4F as the extraction solution (Brookes et al., 1982; Oberson et al., 1997) on fresh soils. Phosphorus concentrations in the extraction solutions were determined on Thermo Jarrell Ash axial IRIS ICP-AES. CDFE-P was calculated as the difference between the P extracted from the fumigated sample and that from the non-fumigated sample. All data are reported on a 105 degrees C dry weight basis. Roots were washed through a series of three Nalgene sieves (sieve opening sizes: 2.0, 0.5 and 0.2 mm respectively) to remove soil particles and extraneous organic material. Fine roots (< 2mm diameter), considered most active in nutrient uptake, were sorted into live and dead categories based on appearance and tensile strength (Vogt and Persson 1991), dried at 65 degrees C and weighed to determine mass. Samples from replicate plots were bulked as necessary to provide enough tissue for nutrient analyzes, and ground in a Wiley mill. Total tissue C and N were measured on a CE Instruments NC2500 soil analyzer (CE Instruments Lakewood NJ). Fine root tissue P concentrations were determined on a Thermo Jarrell Ash axial IRIS ICP-AES after a modified Kjeldhal digest (Parkinson and Allen 1975). Recovery of P in NIST apple leaf standard averaged 92 + 1.6 %. Forest floor phosphorus and soil bulk density, carbon and nitrogen forest floor samples were dried at 50 degrees C for 3 days and weighed to determine mass. A set of sub-samples was dried at 65 degrees C and a conversion factor was developed to calculate mass on a 65 degrees C dry weight basis. Samples were ground in a Wiley mill and passed through a 40 mesh. A 0.5 g sub-sample was ashed at 550 degrees C for 4 h in order to determine the inorganic composition of each sample. Total P concentrations were determined as described for the root tissue and reported on a 65 degree C dry weight and ash free basis. Bulk density was determined by measuring fresh weight of soil from 3 cores (282.6 cm3 volume, 0-10 cm depth) from each plot and a fresh to oven dry (105 degrees C) conversion developed from a subsample from each core. Air-dried soils from each collection were passed through a 2 mm sieve, ground, and analyzed for total C and N using the methods described for root tissue. Brookes, P. C., D. S. Powlson, and D. S. Jenkinson (1982), Measurement of microbial biomass phosphorus in soil, Soil Biol. Biochem., 14, 319–329, doi:10.1016/0038-0717(82)90001-3. Frizano, J., A.H. Johnson, D.R. Vann and F.N. Scatena (2002), Soil phosphorus fractionation during forest development on landslide scars in the Luquillo Mountains, Puerto Rico. Biotropica, 34, 17-26. Rodrigues, T.E., R.C. Oliveira Jr, M.A. Valente et al. (1991), Caracterizacao fisico-hidrica dos principais solos da Amazonia. I. Estado do Para. Convenio EMBRAPA-FAO. Relatorio mimeografado. Tiessen, H. and J.O. Moir (1993), Characterization of available P by sequential extraction. In: MR Carter (ed) Soil Sampling and Methods of Analysis. Lewis Publishers, Boca Raton. Vogt, K.A. and H. Persson (1991), Measuring growth and development of roots. In: JP Lassoie and TM Hinkley (eds) Ecophysiology of forest trees: techniques and methodologies. CRC Press, Boca Raton.